While the European Union has only entered public awareness in the last couple of decades, it is actually much older. Formed in secret by Europe's political elite overlords over half a century ago, it quietly grew in strength until its unveiling at a point in its growth when it was probably "too big to kill" by its victims (the people of Europe). It reveals the lie to the modern concept of the modern "social democracy" because the means of its formation was anything but "democratic" in the literal sense -- "demos" meaning "people" and "kratos" meaning "power". Libertarian: Pallas widely conjunct Sun and Mercury, trine North Node, co-ruled by Neptune which is quincunx Sun. Authoritarian: Pallas opposite Jupiter, quincunx Pluto, and co-ruled by Jupiter which is trine South Node. A complex pattern, mostly authoritarian. Capitalist: North Node in the Second House. Collectivist: Neptune on Second House cusp, quincunx Venus. South Node in Taurus. Strong factors both ways, but stronger on the collectivist/socialist end. Conservative: Moon quintile North Node. Mostly authoritarian + mostly collectivist + mostly liberal --> "gentle" Left-Authoritarian. Kite: Venus/Sun against Neptune/Jupiter/Pluto: Financial dissolution (Venus at the anoretic degree of Pisces) by hidden powers (Neptune in Scorpio), ideologies regarding stewardship (Jupiter in Virgo) and egotistical plutocrats (Pluto in Leo)?? 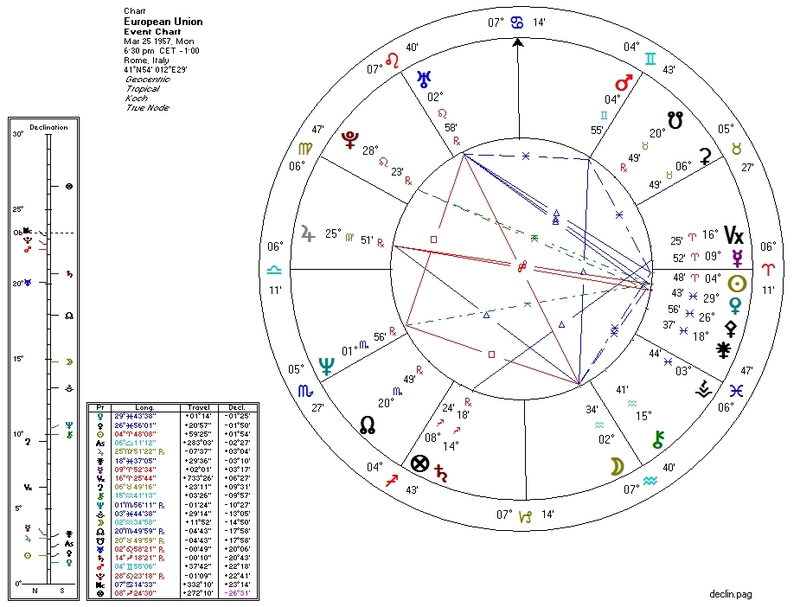 Moon/Neptune/Uranus T-square: dissolution and disruption of culture/race/homeland? Saturn in Sagittarius in Third House: communication issues? The transiting South Node moved over the EU Sun early this month, reflecting the fact that cracks are appearing in the EU edifice around Greece. This is the first such transit during the EU's "public" phase. While the entity has survived two other such transits, they where at a time during which the creature was protected by its veil of secrecy. From here on out, it must endure much more scrutiny.